Does anybody remember this discrete little number, the ‘Mattel Aquarius’? This was one of those computers that never really made any waves in the computer market. 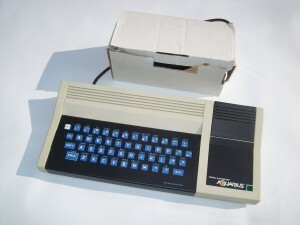 However, it still needs some recognition in the world of retro-gaming history as it was released within that era when early computers and games started to get interesting and some of the great retro games machines started to emerge like to Commodore VIC 20 and the Texas Instruments ti-99 4a. But like everything in life being finely balanced, Ying and Yang, good & bad etc, the Mattel Aquarius unfortunately falls within the latter region. Internally two systems were manufactured. These were known as ‘Checkers’ and ‘Chess’; Chess being the more sophisticated machine. Mattel contracted for these to become the Aquarius and Aquarius II, respectively. 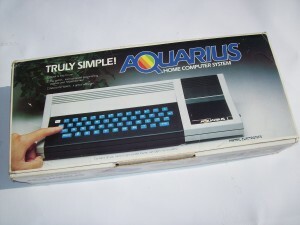 In 1982 Mattel Electronics first announced the Aquarius and Mattel returned to their roots calling upon the the Hong Kong based company Radofin to manufacture the system. Surprisingly, this was the same company who had previously manufactured their Intellivision consoles back in 1979. The system was finally finished and released in June 1983 accompanied by a supposed library of some 32 software titles for the unit. Only 21 of these were ever released, purely because most of the titles were ports from Mattel’s Intelivision game console. The downfall of the Aquarius was although it was sold in many high street stores, add-o ns needed to be purchased for the system in order to get any real use out of it. 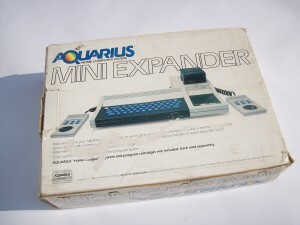 A couple of examples are the Mini-Expander peripheral, which added Gamepads, an additional Cartridge Port for Memory Expansion. These items were not cheap at the time and to think that these came as standard on many competing systems. If you dig a little deeper the GI AY-3-8914 sound chip, was the same one used on the Intellivision console and the keyboard resembled that of the sinclair spectrum. No wonder that internally, Mattel programmers dubbed it “The System for the Seventies”. Other common peripherals were the Data recorder, 40 column thermal printer, 4K and 16K Ram Cartridges. Less common peripherals include a 300 baud c artridge modem, 32k ram cartridge, 4 Colour Plotter, and Quick Disk Drive. The system finally came to an end when Mattel paid Radofin to take back the marketing rights largely because production had ceased four months later because of poor sales. Four other companies, Bentley Industries., CEZAR Industries., CRIMAC Inc., and New Era Incentives, Inc., went on to market the unit along with the accessories for it, but with little success. PSU: Hard-wired into case and cannot be removed. These machines are getting quite rare and hard to find especially boxed and in good condition due the small amount that was produced. The peripherals are even rarer. Things to look out for when buying one of these is make sure you get the overlay for the keyboard with the character symbols on and make sure the keyboard works as they are very temperamental. Get a good one and it will surely only go up in value. . .